Join PPWN and the Metta Center for Nonviolence for a two-day introductory workshop in Kingian Nonviolence!!! 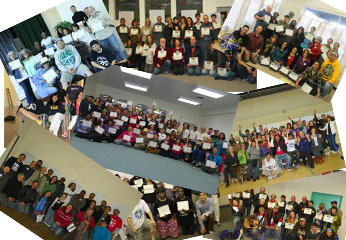 Over 1,200 people attended this workshop in 2012, with participants ranging from incarcerated men and women, students (middle school, high school and college), activists, former city mayors, anarchists, meditation teachers, school teachers, and people from every walk of life. Each walked away having learned a skill that will help them with whatever conflicts they are dealing with in their lives and in their work. Find out more about Kingian Nonviolence here. These workshops are offered on a gift economics basis, so no one will be turned away due to a lack of funds. Carpools are being organized from the Bay Area. Contact emailkazu@gmail.com or (510) 967-4710 for more info. This entry was posted on Tuesday, February 12th, 2013 at 3:20 pm and is filed under PPWN Update. You can follow any responses to this entry through the RSS 2.0 feed. You can leave a response, or trackback from your own site.